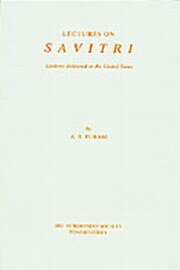 This book contains three lectures on Sri Aurobindo‘s epic Savitri, delivered in August 1962 by the late A.B. Purani during his visit to the United States. The lectures have been edited to make them more readable, but an effort has been made to retain the lecturer‘s “voice” – his characteristic directness, drive and enthusiasm. It is hoped that the book will provide a brief but helpful introduction to Sri Aurobindo‘s poem. Ambalal Balkrishna Purani was born in Surat, Gujarat, in 1894. Inspired as a young man by Sri Aurobindo, then a leader of the Indian National Movement, Purani helped to launch a youth movement which gained widespread popularity in gujarat. At the age of twenty-four he visited Sri Aurobindo in Pondicherry and finally settled there five years later in 1923. From 1938 to 1950 he served as one of Sri Aurobindo‘s personal attendants. Towards the end of his life Purani toured India, Africa, Europe and the United States, trying to spread the message of his Master. In 1965, at the age of seventy-one, he passed away in Pondicherry. 86 pp.